Good news, everyone! Finally, the Ultimaker is shipping. It took much more work that we had ever imagined, and we knew it would be hard to design a complete machine from scratch and also make it easier to assemble, have a larger build volume, be robust and reliable. I really believe we’ve nailed it! One of the important strengths are the incredibly fast and accurate parallel kinematics and the optimized print-volume to footprint ratio (inspired by Ilan Moyer’s design of the MIT MediaLab). Also, the extruder allows for mid-build refilling of plastic or color changes (inspired by Wade’s extruder design). The Z-stage now also has leveling screws so you can more easily make use of that huge build surface. In total it really makes for an easy to operate and fast 3D printer. The Ultimaker has just started shipping, and since we promised to publish all design files as open hardware, we’ve just published them to Thingiverse.com. Of course, business-wise it seems like a big leap of faith to do this, but we are confident that it will turn out very well! So happy hacking! We think the Ultimaker is really a good start, but it needs your ideas to be great! Ultimaker Map as of May 15th 2011. Blue are people in the pre-order, green have shipped! 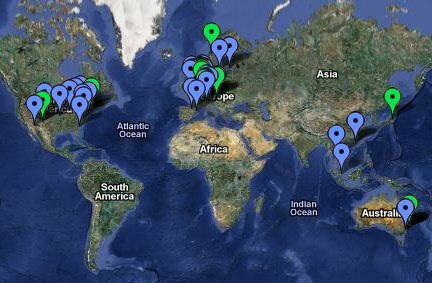 Some pins are missing because the picture is only a snapshot, click to get the most recent map…. Feel free to add yourself! De diverse posts van afgelopen maanden, zoals de Pick-N-Place tape feeder, verraadden een berg werk.